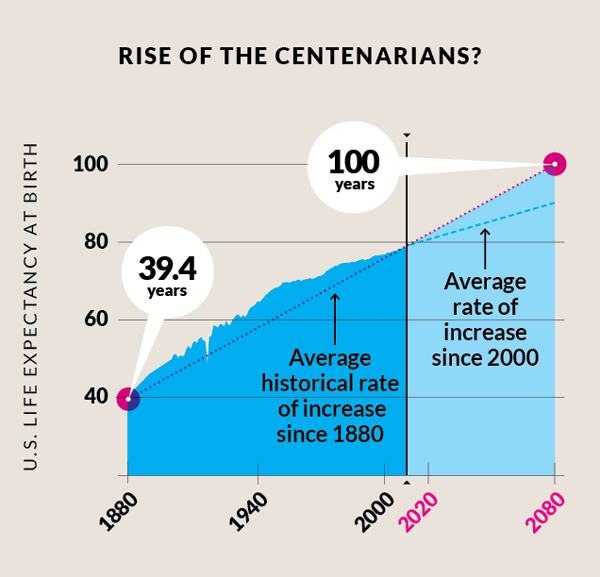 Easterbrook cites James Vaupel of Germany’s Max Plank Institute for Demographic Research to the effect that it is a “reasonable scenario” that increases in life expectancy will continue at least until the average expected lifespan of newborns surpasses 100. Vaupel is not predicting major medical breakthroughs that would result in such an increase. Past increases have come about as a result of numerous improvements in areas such as nutrition, public health, sanitation, and medical knowledge; he expects future increments in life expectancy to result from continued gradual innovations in these fields. Even those among us who are slow to learn eventually realize that the excitement that comes with new possessions fades pretty quickly. Formerly new things that are now worn, or have worn out their welcome, clutter our closets and attics. So what’s the point of adding to our store? Besides, there’s little appeal in keeping up with the Joneses when Mr. and Mrs. Jones, now nonagenarians, have slowed to a crawl. For most of us who are done with childrearing, our bonds with our children continue to be among the most important relationships we have. Still, once free of the demands of child care, we have more freedom to cultivate additional relationships. As I’ve gotten older, fewer of my friendships are with people I work with, and more are with people with whom I share other affinities. I look forward to having more such friendships in the years to come. Perhaps what will give “the golden years” their luster are the rich relationships that are to be found there. This entry was posted in Culture, Relationships and tagged aging, consumerism, death, elderly, Gregg Easterbrook, life expectancy, lifespan, older adults, seniors. Bookmark the permalink.